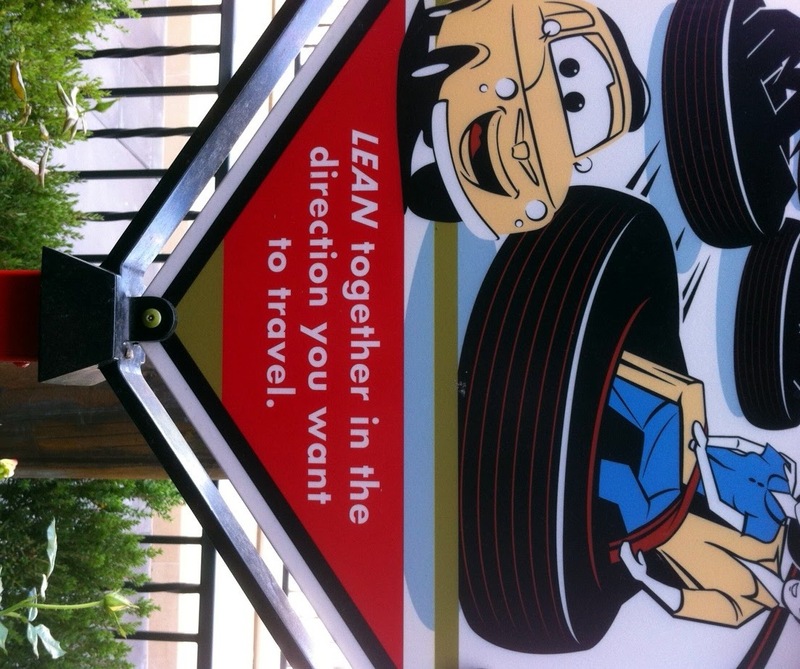 This sign is at Cars Land at Disney California Adventure in Anaheim. Ride? Luigi's Flying Tires. It's advising people in the queue how to maximize the ride. Obviously, though, it is a wonderful message for life, too. I keep this idea in my heart when I approach these stories. Love this! I think accidentally poignant things somehow make you think a lot more than if someone explicitly made the statement. Or maybe it's on purpose? It is a pixar ride, and the sneakily making you feel all the feelings thing is kind of their forte. Pixar! Yes. Now I'm thinking it might be on purpose. 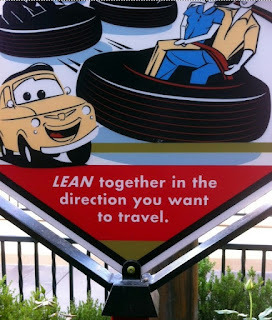 Next time I'm in Cars Land I will be checking out all the signs more carefully. ♥ Pixar ♥ Do you have a favorite? I'm very big on "WALL-" and "Up." But all of them. And that existential sign article is exactly my thing. I'm very interested in layered meanings. Definitely sharing that one. Love all the Pixars, and speaking of layered meanings, thats probably what I like best about all their movies. They work on so many layers, so they get better every time you watch them. I think the Incredibles is maybe my favourite, but it's hard to pick! I love Up, but it sort of traumatised me. I went to see it the day it was released with my sister, and I really hadnt heard anything about it, so I was completely unprepared for all the emotion. It was a whole cinema full of little kids clapping and smiling while me and my sister were trying to control the sobbing! Hoo boy. I'm a HUGE animation fan, so I'm sitting here attempting to curb my desire to write eighteen paragraphs back to you. Love "The Incredibles"! My favorite thing about that film, besides Jack-Jack (obvs. ), is the voice casting. I think that's very tricky with animation, and too often big stars are shoehorned into roles that aren't right for them. I find it jarring and it takes me out of the story. But "The Incredibles" have the exact right actors. Holly Hunter! Perfection. Ah yes. "Up" is so emotional, and that's another thing I love about it. I just marveled how five minutes into the film they're telling the story of these two people growing old together. In what is ostensibly a kids' movie! Only Pixar. They take chances, which is another reason I love them. And they never water stuff down for broadest appeal. By the way, Fair Finley may not like movie montages in real life (she likes experiencing experiences in real time) but I'm crazy about the montage at the start of "Up." Oh my heart. I can't think about it without welling up. Beautifully done. Aww, you and your sister. Glad you had each other! Yes! That moment from Up is the absolute best. Gives me joyful happy dance feelings every time! And the montage is perfect, so completely affecting. Anyone who can watch that without welling up has a heart of stone. I agree the voice casting in the incredibles is spot on, and it makes a huge difference. I always though that about Toy Story as well. They got big stars, but not just for box office pull. They though about the roles and cast them perfectly. I cant imagine anyone else doing the voices of Buzz and Woody. Ellen as Dory is finding Nemo is amazing casting too.